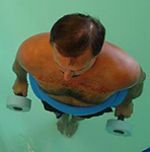 Aquatic therapy plays an integral part in post surgical rehabilitation. Patients are able to perform exercises in the water with the benefit of weightlessness that they would not be able to perform on land. Athletes quickly rehabilitate from injury, improve strength and endurance, learn safe jumping and landing techniques. Bad Ragaz and Watsu are a series of rhythmic repetitive movements to reduce stress, tone and pain, while improving range of motion, posture and body awareness. Treatment is done one-on-one with a therapist, utilizing flotation devices and the buoyancy in warm relaxing water. This treatment has proven effective when more traditional forms of land treatment have not been successful. 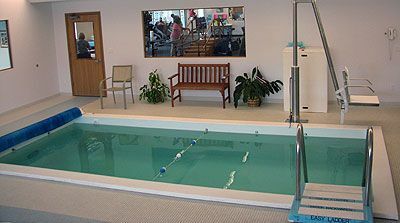 In 2002, Thunder Bay Therapy & Sports Medicine was the first clinic in Northeast MI to offer on-site Aquatic Therapy as an integrated part of a comprehensive therapy program. Since the pools introduction, all staff have been trained by nationally known expert Thomas Tierney of Aquatic Rehabilitation Systems. In 2004, LuAnne Benac, PTA became our on-staff aquatic coordinator. Through her extensive experience and continuing education, LuAnne champions the rehabilitative benefits of warm water therapy. 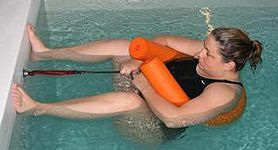 Aquatic Therapy is a low impact way to exercise and rehabilitate muscles in a gravity neutral environment. Warm water helps relax muscles and decrease pain. Buoyancy: Reduces weight bearing up to 90%. Allows for movement without the stress of gravity on joints. Viscosity: naturally and gently resists movement in all directions. Turbulence: challenging balance and core muscle stability in all directions from drag and water wake. Hydrostatic Pressure: Surrounds, soothes and supports by providing equal pressure on the body. Compressive forces decrease swelling and increase blood and lymphatic flow. 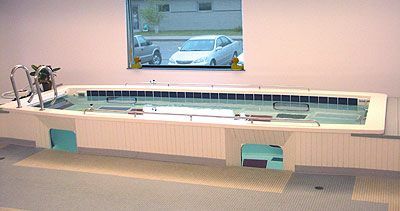 Thunder Bay Therapy & Sports Medicine offers two unique therapy pools. The in-ground (above) is ideal for most patients with 4ft and 5ft depths and is accessible from stairs or patient lift. The SwimEx 600T: Like a stream with an adjustable current, this pool challenges the most aggressive athlete or can produce a gentle resistive current. Professional and collegiate sports teams quickly rehabilitate their athletes using the SwimEx pool. Water Temperature is a thermo-neutral 92°. The warm water increases flexibility while decreasing muscle tone, spasms and pain.